Mining resources and space travel are not Luxembourg’s first involvement in space. For more than 30 years, Luxembourg has been at the forefront of commercial and co-operative developments to promote the use of space in ways that improve the quality of life on Earth. In 1985, a public-private partnership effort launched Société Européenne des Satellites, today known as global satellite operator SES. SES operates a network of satellites in geostationary and medium earth orbits that deliver TV and radio, internet connections, data and voice to homes and workplaces around the world. Luxembourg is an active member of the European Space Agency (ESA) and in particular of ARTES, the ESA program to develop innovative satellite communications systems and services. Luxembourg contributes significantly to Europe’s 40% share of the global satellite business, supporting thousands of highly skilled jobs and keeping billions of people connected. Luxembourg’s proactive approach has made it home to an increasing number of companies developing novel products and systems in the space and ground segments, and delivering services and downstream applications. Among them are recently established start-ups from the space mining industry that have set up European operations in Luxembourg with the support of the government. Many of these industry players and their suppliers have joined the Luxembourg Space Cluster, whose goal is to initiate joint R&D projects, often in the frame of ESA or EU programs. Space resources businesses are logical new members of this expert community. In the years to come, the focus on space resources exploration and utilization will generate attractive opportunities in Luxembourg for established and start-up players in areas including materials science, additive manufacturing, remote sensing, communications, robotics, data analytics and artificial intelligence. 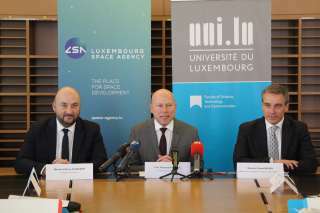 Luxembourg drew up its first action plan for space research and development in 2008. The space resources initiative goes further. The government is providing substantial financial assistance to academic research and private sector projects developing the technologies mankind will need to explore and use space resources. LuxIMPULSE is providing funding to help companies bring innovative ideas to market. Luxembourg’s contributions to and involvement in the European Space Agency and other international R&D programs play a significant role in the exchange of technology, ideas and knowledge. Exploring space resources is not just for the select few. Through schools, universities and businesses, Luxembourg also promotes understanding of the economic and other benefits to humanity as a whole. Under a joint initiative between the government and the ESA, the Young Graduate Trainees program– LuxYGT is already helping to develop the next generation of space engineers. Luxembourg provides an efficient legal and regulatory framework with a dedicated space law that ensures stability and guarantees a high level of protection for investors, explorers and miners. The Grand Duchy is the first European country to offer a legal framework on the exploration and use of space resources, ensuring that private operators can be confident about their rights on resources they extract in space. The first article of this space law provides that space resources are capable of being owned. This approach is not only in accordance with basic principles of French-inspired property law, it is also consistent with international law, in particular the Outer Space Treaty. Celestial bodies themselves are not subject to national appropriation. The Luxembourg law clarifies the status of the resources that can be extracted from those celestial bodies and in space in general. The Luxembourg law also lays down the regulations for the authorization and the supervision of private space exploration missions, including both exploration and utilization of space resources. Whoever intends to undertake a space resources utilization mission will be required to obtain a prior ministerial agreement, for each specific and determined mission.